The quarter ounce American Gold Eagle is the official bullion coin of the United States Mint. In 1907, President Theodore Roosevelt commissioned the famous artist and sculptor Augustus Saint Gaudens to redesign all of the gold and silver currency for the entire nation. 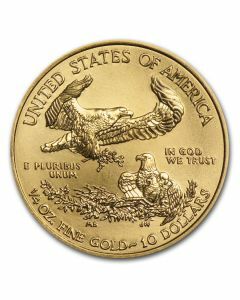 The ¼ ounce gold eagles are one of the smallest bullion choices in the United States, but that doesn’t mean they aren’t every bit as popular as the larger ½ ounce and 1 ounce Gold Eagle coins. 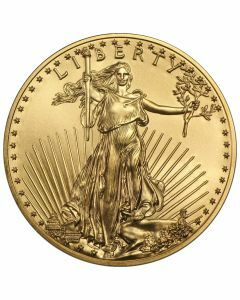 Like all Gold American Eagle Coins, the quarter ounce Gold American Eagle is the perfect coin for both investors and collectors. 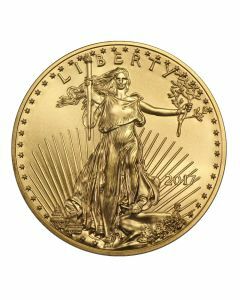 With a far more affordable entry and the ease with which these coins sell, beginner investors will have no trouble finding their way into gold bullion investing when they choose the ¼ oz Gold Eagle. The diameter is 22mm, and the gross weight is just over .27 troy ounces, making these coins simple to store, transport, and display. But collectors will likely find that the ¼ ounce Gold Eagle coin is more suited to their need. With the famous Lady Liberty on the obverse, surrounded by a sunburst, and the white house gracing the background, and the fearsome eagle on the back, bringing an olive branch back to his nest filled with mate and young, this coin is truly a work of art. Every piece, down to the eagle’s feathers and the pleating in Lady Liberty’s dress, is worked in perfect detail. 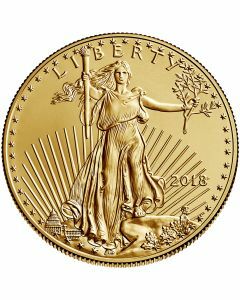 With a $10 face value, and marked with the United States’ motto, the ¼ ounce US Mint Gold American Eagle is IRA-eligible, making them an excellent option for those who want something unique to display, but also a long-term investment in their future. A diverse retirement portfolio can help safeguard against economic fluctuation, and gold and other precious metals are always valuable commodities that are easy to liquidate. Pick up one of these fractional Gold American Eagle coins today at the lowest gold coin prices online! Also, make sure to keep an eye on the spot price of gold to best time your next purchase.